HomeArticlesEcoKids Battery Busters: Waste Reduction Week Contest! EcoKids Battery Busters: Waste Reduction Week Contest! Take Action This Waste Reduction Week and Run a Battery Recycling Campaign in Your School! 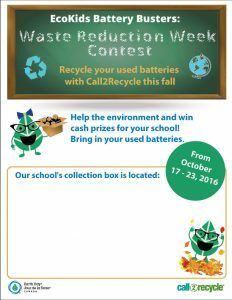 Call2Recycle partnered with EcoKids to invite schools to participate in the Battery Busters: Waste Reduction Week Contest! Get your whole school community involved to collect as many used batteries as possible for your chance to win prizes that will help support future environmental initiatives at your school. Four prizes will be awarded. $1,500 for the school that collects the most used batteries; $1,500 for the school that collects the most used batteries in relation to their school population; $1,500 for the school with the most creative and original battery collection display; and $1,000 will be awarded to one school selected by random draw. How to participate, a quick step-by-step guide! Go to EcoKids’ website and read the contest rules and regulations to learn about the contest details and make sure your school qualifies to participate. Register to receive two of our collection boxes by September 30, 2016. Your collection boxes will arrive by October 17, 2016. From October 17 – 23, 2016, collect used single-use and rechargeable household batteries (weighing up to 5 kg each) by establishing an exciting and creative battery recycling campaign. Be sure to decorate and have fun with your battery collection boxes, check out our battery recycling resource package to learn all about batteries and why battery recycling is important, and download the contest poster to help you promote your campaign. At the end of your campaign, battery collection boxes must be scheduled for pickup on or before October 28 2016 and returned to us. Submit a photograph of your creative battery display to Earth Day Canada online by October 28, 2016 for your chance to win the $ 1,500 prize for creativity!